“BR AUTO” is fully automatic and is manufactured either with 10, 16 or 20 heads to give an hourly output between 2000 and 8000 bottles. This machine will handle containers of any size, shape and capacity. Infeed by feeding scroll and starwheel to the neck gripping turnover unit and place over the injection jet with effective rinsing. The injected solution can be disposed to drain or re circulated as a closed cycle via filtration. Neck gripper plastic insert to suit the bottle mouth configuration, quick and simple change over. Adjustable rinse and drain time. 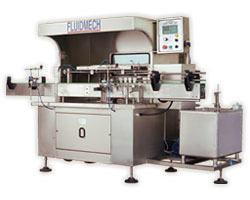 An automatic linear type of bottle rinsing machine for rinsing internal section of bottles with sterilizing solution or product. Empty bottles are fed by conveyor to the bottle gripping station. Once the sensor detected bottles in position, the bottle gripper will grip all the bottles and the whole station will rotate 180 degree backward so that all the bottles will be in invert position with bottle mouth station on top of the spray nozzles. Once all the bottles are in placed, spraying process will start and the spray time is adjustable to each individual requirement. Spraying will stop once it reaches the present spraying time, dripping of excess water in the bottle is allowed according to the time setting for the dripping. The gripping station will turn 180 degree forward to its original home position at the end of the dripping time. Automatic gating system will move the 6 rinsed bottles out from the gripping station and the rinsing process continue with the new bottles. 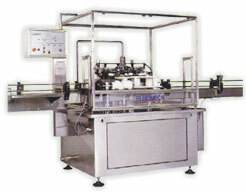 Equipped with 20 Nozzles for rinsing internal section of bottles with sterilizing solution or product. Bottles are inserted upside down into the bottle neck catch or holder manually. 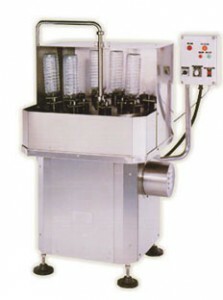 The rotary disc with 20 holders are designed to suit the bottles. This rotary disc with the bottles inverted will arrive to the product injection. The injection phase has 2 stages. At the end of the second injection stage, the product dripping will be recovered by canalisation and discharged from the machine. Bottles will be replaced manually after the dripping phase. The rotary disc turning speed is adjusted by a knob on the control panel. A stainless steel pump is mounted inside the machine. Polycarbonate Filter Cartridge to recycle the product to the rinser.